Visiting Central Pennsylvania? 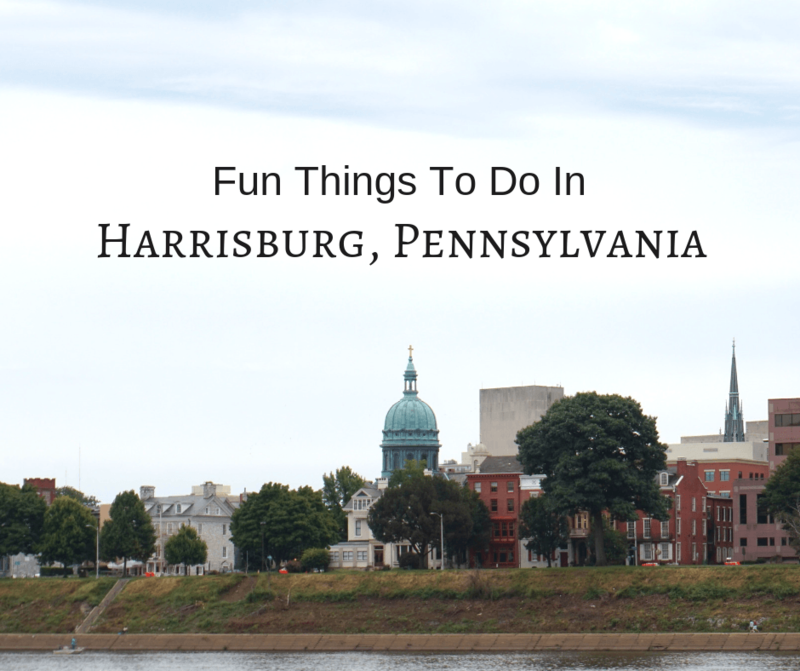 Here’s our list of fun things to do in Harrisburg. Find everything from riverboat cruises to giant bookstores! Pay a visit to what President Theodore Roosevelt called “the handsomest building” he ever saw. We agree with Teddy, and think the PA State Capitol is quiet impressive. We recommend taking a free guided tour with their very knowledgeable staff. They take just over 30 minutes and we learned a lot more than we would have if we’d just walked around ourselves. You can click here to help plan your visit. Our guide explained how the building was a mixture of different architectural styles and that the 272 foot rotunda was inspired by Michelangelo’s design for St. Peter’s Basilica in Rome. The various paintings throughout the structure were also done by prominent artists of the time (including some female artists) and they highlight Pennsylvania’s achievements in labor, industry, and history. Fun Fact: All three branches of government are located in this building and there are viewing areas above the House and Senate so you can watch a session. Really get to know Pennsylvania by visiting this museum. Go back to the time of the dinosaurs, or learn about the Native Americans of the area. Visitors will also learn about how the commonwealth was founded and see vehicles and machines that revolutionized the transportation industry. The museum also has a planetarium, which we thought was really fun. In other words, they present the history of the war without bias to Union or Confederate causes. As we walked around, it definitely had more of a human feel to it, with videos and displays that told the stories of real individuals; the museum doesn’t just throw statistics at you. Definitely give yourself more time for this museum as there are some really interesting displays. We think this is one of the top things to do in Harrisburg! The history of fire fighters in Harrisburg is a proud one and you can learn all about it at this fun museum. It was once the 2nd oldest firehouse in Harrisburg and was converted into a museum in 1995. It is run completely by volunteers. Dave and Don, both retired firefighters, gave us a tour. It’s not a very large museum, but it has quality pieces that show all eras of the fire fighting history in the city. We saw all kinds of equipment, recreations of fire fighters’ quarters, and even got to pull a fire alarm so that we could see how it works and notifies the appropriate stations. Incredible artifacts show how different it was to combat fires centuries ago. Another one of the fun things to do in Harrisburg is to “Ride the Pride” down the Susquehanna river. This authentic paddle wheel riverboat has been delighting visitors for 30 years. It was built for the community and over the years has hosted events like weddings, themed dinners, and business functions. After paying for whatever maintenance the riverboat may need, all leftover proceeds from ticket sales go to community service projects. Visitors to Harrisburg can take a 45 minute tour on the riverboat. As you travel on the river, a recording plays on speakers that tells about the history of the river and native animal and plant life. The recording also points out significant buildings as you pass them. It was nice to see the city from a different perspective. Probably one of the most unique things to do in Harrisburg is to wander around Midtown Scholar Bookstore. Book lovers won’t want to leave this independent bookstore that has over 200,000 new and used books covering all fields. Seriously, we kept turning a corner and finding more books! The basement is a labyrinth of books! On multiple floors, visitors will find over 200,000 books! The Broad Street Market is one of the oldest continuously operating farmers markets in the country. There are restaurants where you’ll find everything from cheesesteaks to tacos, bakeries selling fresh made fudge, and many more stalls selling everything from flowers to tomatoes. There’s a fun atmosphere here and we enjoyed walking around and taking in all the yummy smells. Pro Tip: If you like sweets, we recommend you stop by nearby Hershey’s Chocolate World. We really love the concept of The Millworks. Here, it’s all about supporting locals; local growers, local artists, and local businesses. There’s a restaurant, brewery, and rooftop biergarten that all use local ingredients from the Central Pennsylvania area. There are also 32 regional artists that have studios on site so you can walk by and see what they’re working on. Our favorite area of the Millworks was the outdoor courtyard in the center of the building. From there you can sip on beer or wine and look in to the windows of the artists studios. It was sprinkling when we visited so we didn’t spend any time there, but we can see how it’d be a really chill spot to relax with friends. Ready to book your trip to Harrisburg, Pennsylvania? Check out the rates below! To be completely honest, there’s more to do in Harrisburg than we originally thought. We think it often gets overlooked because of nearby Hershey, but the museums and eateries were really impressive. We definitely recommend a visit if you’re in the area. A big thank you to Visit Hershey & Harrisburg for helping us set up this fun itinerary. Although we were offered some complimentary tickets, as always, all opinions are our own. Thank you for sharing. Harrisburg is one of those hidden treasure cities that have so much to do. I have done most of the sites. I even visited the old railroad tower and wrote an article about it on my webpage. (it is a few months old now.) I am glad that you have fun in Harrisburg. You are welcome. It is only open on Saturdays in the Spring and Summer, but it is worth visiting. Aww. You are very graciously welcome, and you truly are a great person. You would probably be a great person to travel with. What a great looking place to visit. I would go for the book store and then stay for all of the other sites and attractions. I love visiting bookstores in those rare times that I travel. I will be visiting Harrisburg every other week for work. I will definitely check out bookstore and Broad Street Market. Thank you for this great article.